We had several other asthma incidents over the next couple of years, but with medication and a nebulizer, we were mostly able to keep things under control. She was in the hospital only one other time, right before she turned 2. When she was 2 1/2 or 3 (I forget when), our pediatrician put her on a daily regiment of a Flovent inhaler (2 puffs every morning) and a Zyrtec. She hasn’t had an asthma attack since then. Even when she was sick, she never wheezed. I know some kids outgrow asthma, but given that Dave has asthma and still has to manage it daily, I wasn’t terribly optimistic that Catie would be one of those kids. When I had mentioned it to doctors that she hadn’t had an asthma attack in such a long time, and did they think it was possible that she had outgrown it, they’d kind of shrug and say maybe, but that it wasn’t worth the risk of taking away her meds to find out. Earlier this week, we went to the pediatrician for something completely unrelated – Catie had a rash on her face, which turned out to be Fifths Disease (common viral rash, passes after a few days). While we were there, as part of the standard patient work-up, he asked for her current medications. I told him, then he asked when her last asthma attack happened. I said that it had been when she was 2 1/2 or so, I wasn’t sure of the exact date. I have an ear nose and throat doctor who does allergy testing, so we’ll look into that at some point. She’s obviously allergic to some things, because she’s been coughing non-stop since pollen season started. But allergies don’t feel as terrifyingly life-threatening as asthma. She was just being silly, but man, I totally understand that feeling, sweet girl. The hotel we stayed in near Heathrow had one U.S.-style outlet, so the nebulizer worked fine while we were there. Once we got to my mother-in-law’s house, though, not so much. I don’t know what’s up with the nebulizer’s voltage, but it shorted out no less than THREE different power adapters. I was starting to panic because Catie had gone a few days with no Pulmicort, and December is never a good month for her asthma, so I really didn’t want to let it go for too long. I figured that the next best option would be to get a Pulmicort inhaler; I already have the spacer, so it would just bypass the need for electricity altogether. She’d hate it, but you know, desperate times, desperate measures. So last Tuesday, before we left for Scotland, I called a pharmacist and explained what was going on. I asked her what would be the fastest way to get an inhaler for my daughter. She said that if my mother-in-law had her own doctor, getting Catie an appointment as a temporary patient would probably be a lot quicker than going to the ER. Mags called her doctor, and got us an appointment time less than 2 hours later. We checked in, and they didn’t take my U.S. insurance card or ask for any money. We overheard someone say that there was only one doctor working that day, so there might be a long wait. I suppressed my internal groan, thinking that we were about to experience one of these nightmarishly long waits that I had heard about the UK healthcare system. I explained to the doctor about Catie’s asthma, the blown-out nebulizer, and the medication I needed in inhaler form. He wrote me a prescription on the spot. The end. The whole appointment took less than 5 minutes, and cost NOTHING. We wanted to hit the road for Scotland after Catie’s appointment, so we ended up getting her prescription filled in Inverness. That took another 5 minutes. And here’s the kicker: in the US, Catie’s inhaler would cost us $40 *after* our health insurance coverage kicked in. In the UK? Because Catie is under 16, all prescriptions for her are FREE. The pharmacist actually looked confused when I tried to give her my credit card. It’s funny, I expect a fair amount of culture shock when visiting a new country for the first time, but that was the first thing here that honestly made my jaw drop. I learned that prescriptions are also free for pregnant women and senior citizens. Huh. I can think of more than a few people who might find that helpful, if not life-saving. So, based on my experience, I have to say that if that is what one should expect from this evil “socialized medicine”? Then, hell, go ahead and sign me up as a socialist. Because that was freaking awesome. Note: I wrote this post a few days ago, thinking that’d be the end of it. Now it looks like I’ll actually have a two-parter on socialized medicine, because Dave and I have both come down with some sort of Evil Sinus Infection of Doom That Won’t Die, and we’re both going to see my father-in-law’s doctor this afternoon. I guess we’ll see if I’m still as impressed with the UK medical system after this. I know the topic of whether or not to get the H1N1 vaccine is kind of a hot-button issue. A lot of parents are opting to skip it. I honestly don’t understand why, but my view on this issue is skewed. Catie’s asthma is severe enough that a bad cold can land us in the ER (and it has, twice). The thought of her getting the flu scares the bejeezus out of me. I don’t even want to try to think about how awful that would be. Honestly, I don’t know if I would still feel strongly in favor of the H1N1 vaccine if Catie didn’t have a chronic respiratory illness. But there have been 86 children that have died from H1N1 this year so far. Sure, statistically that’s a very small number, but it’s still 86 too many. I can’t imagine what those parents are going through, but I imagine that if they could reverse time and get their children a vaccine that would prevent them from getting sick, they would. I also don’t know the conditions behind those deaths, if those children had other contributing factors that compromised their immune systems. But I know my kid, I know how her little lungs are not prepared for a severe flu, and I’m taking every imaginable step to prevent that from happening. The problem is that no one seems to have the H1N1 vaccine. Anywhere. I saw on the local news this weekend that our county’s health department received 3000 doses, and that they’d open their clinics to give the H1N1 vaccine on Monday morning at 9 a.m. So today we got up early and drove to our nearest clinic (a good 30 minutes away) to be there when they opened. (Note: there are four different clinics in our county. 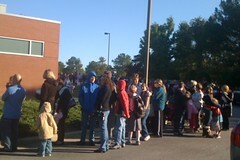 I thought odds were good that the clinic we went to would be less crowded since it wasn’t the one in downtown Raleigh.) Clearly, we were not the only people who had that idea. There were literally hundreds of people there. The line wrapped around the building and down the block. The best picture I could get. Doesn’t even begin to show just how many people were there. I grabbed my cell phone & called, and the nurse said that they have “a limited supply for high-risk patients.” I said, “I have a two year-old with asthma, does that count?” She said yes, and asked if I could come right then. I said yes, and quickly got out of the mile-long health department line. So, back into the car for the 30-minute drive back to town (thank goodness we were in Dave’s car so Catie could watch the Wiggles on the DVD player; I heard nary a peep of objection during all of this back-and-forth driving). Since we only had to see the nurse and not the doctor, they got us in and out of there in no time. We went ahead and got both the seasonal flu shot & the H1N1 (she’ll need a second dose of the H1N1 in a month). The shots were awful, of course. I had told Catie that the nurse was going to give her medicine so she wouldn’t get sick, but you know, a needle is a needle. She screamed and cried, until they whipped out the magic lollipop reward, then she was all happy and smiles again. She hasn’t shown any signs of side effects so far, and I hope it stays that way. Now it’s just up to Dave and me to get our shots (Dave’s afraid of needles, so I’ll probably only be able to coerce him into the nasal mist kind). Because really? I do not need a repeat of last year’s trip to the hospital. In fact, if I could stay away from pediatric ERs for the rest of my life, that’d be fine with me. why does she always get sick on the weekend? Oh hey, know what’s funny? You know how in that previous post I very casually mentioned in the first paragraph that Catie had a stuffy nose that woke her up? And then I quickly moved on, without even noticing that gigantic anvil labeled “FORESHADOWING” hanging over my head? Yeah. So the past 36 hours or so have been a blast, let me tell you. It wouldn’t be so bad if it was just a cold. Kids get colds all the time. But colds for Catie mean asthma flare-ups, and trying to take care of a kid who’s lying on the floor crying because she can’t freaking breathe? That is a level of stress that I don’t wish on anybody. Thankfully, we’ve stayed out of the hospital this time, but there was a brief moment last night when we debated on whether or not we were going to take her to the ER. I was up with her a good portion of Friday night, and since I was exhausted, Dave took over last night to let me sleep. The poor guy was so worried about Catie that rather than sleeping in between her wake-ups, he just stayed up all night. He finally went to bed when I got up, around 9 this morning. Poor guy. As for Catie, she seems a little better today. She’s still pretty raspy and wheezing a little, but she’s also eating some Cheerios and drinking watered-down juice. And she’s actually talking rather than wailing and crying, so that’s definitely an improvement. Really, this is all the more reason that we’re getting our flu shots this year. I know that the H1N1 vaccine is a little controversial, but seriously, if a simple cold can make my kid so sick that she almost ends up in the hospital, there is no way that we’re going to eff around with the possibility of her getting H1N1. Her pediatrician’s office doesn’t have the vaccine yet (apparently only local health departments have it now, a lot of private practices don’t), but I’ll be taking her in for an appointment as soon as they have it. Now let’s just hope that this is the worst of it. Catie’s had a cold since our camping trip last weekend. At first it was just an endlessly drippy nose, but yesterday her asthma started to flare up. I didn’t think too much of it right away, because it didn’t seem that bad. When she had an asthma crisis back in December, I knew something was wrong because she was lethargic and obviously miserable. She would only moan and cry when she woke up, then go back to sleep. But with this current cold, she’s generally been pretty cheerful and acting like her normal self. I mean, yes, she’s been wheezing a little bit off & on, but she’s also singing, laughing, and narrating little stories that her toys act out. So we were giving her albuterol & pulmicort in the nebulizer – the way we normally treat her asthma – but I wasn’t that worried. This morning, Dave got up with Catie to let me sleep in a little longer. (Love it when he does that.) A while later, he brought her upstairs to bed, and she snuggled in next to me. I was spooning her with my hand on her chest, and I could feel how rapid her breathing was, and how fast her heart was pounding. I told Dave we needed to give her some albuterol, and he said he had just done it a few minutes ago. I promptly freaked out and called the pediatrician. They told us to come straight in, which we did. I think the words “asthma attack” have some sort of magical power on pediatricians. They were waiting for us when we got there, and brought us straight back to a room. The doctor came in immediately. They tried to get a pulse ox on Catie’s finger, but she wasn’t having it (oh, the shrieking), and they couldn’t get an accurate reading from her big toe. We finally got her to calm down enough that the doctor could listen to her chest with the stethoscope. Not our usual pediatrician: Um, her lungs are clear. Me: But she’s been wheezing since yesterday! NOOP: When was her last albuterol treatment? Me: About 45 minutes ago. NOOP: Well, it’s clearly working because she sounds fine now. Me: But she’s breathing so fast! And her heart is pounding! NOOP: Her airways are definitely open, she’s not in respiratory distress at all. I think the worst of the cold has probably passed, so just keep doing what you’re doing with the nebulizer and you should be able to wean her off the albuterol by Friday. I’ll be honest, I think part of the reason why I reacted so strongly was because I was thinking about Maddie. When I was lying in bed with Catie and I felt how fast and hard she was breathing, it scared the wits out of me. Before two weeks ago, it never once entered my mind that a child could ever just stop breathing. I know that Maddie is an exceptionally rare case, I know the odds of anything like that happening to Catie are very remote. And yes, of course it has always been frightening to hear my little girl struggling to breathe, and it always will be. I just don’t know if or when this particular type of intense fear-that-the-worst-could-happen will subside. Am I overreacting? Very likely. But how can I not, when we’ve seen proof that sometimes the worst does happen, for no damn reason? Seriously, how do you not overreact?